Young Start-up Talent (YST), an entrepreneurial initiative powered by NatWest and aimed at young entrepreneurs aged 16-25 years old, were honoured to host their South East Showcase for 2018 at Lingfield Park Resort. After months of hard work, business workshops and presentations, it was announced that sisters Samara and Merissa Gidden of Haus of FLVR were the lucky winners of the YST South East 2018 entrepreneurial prize fund of products and services to help take their business to the next level. Haus of FLVR is an ingenious combined concept in consuming adult beverages paired with the novelty of a traditional ice lolly by producing a contemporary range of alcohol infused products that are not only enticing, by incorporating a myriad of robust flavours, but also causing consumers to fall in love with both the execution and delivery too. The complimentary organic fruit, classic flavour combinations and elegant packaging ensures a gourmet appeal. Following the announcement, Samara and Merissa said, “A wonderful experience filled with professionalism and knowledge. We are so grateful for the mentorship and confidence gained through talking about our business to the sponsors and judges throughout the process” The pair went on to congratulate their fellow finalists. The duo now plans to focus on growing their business using the tools and advice given to them by Young Start up Talent, the Judges and sponsors. See video link that was filmed at Thales and first shown during the showcase event of the finalists pitches and formal presentations. New to the judging panel and sponsor, Ellen Walsh of Grant Thornton commented;” My colleagues and I have been delighted to be involved in Young Start-up Talent. It has been a privilege to meet with such a group of bright young people showcasing some brilliant ideas. At Grant Thornton we know that creating a futureproof, diverse and inclusive workforce is an urgent and ongoing priority for the future of a vibrant economy and we welcome initiatives such as this that encourage and celebrate talent and initiative. Lead sponsor and long-term judge of the initiative, NatWest with speaker Daryl Gayler, Managing Director, South Region commenting; “A lovely celebration of our local young entrepreneurs. It is always so impressive to see the passion, the creativity and the business acumen of our talented young entrepreneurs and NatWest is very proud to be supporting Young Start-up Talent. Thanks also go to 2016 winners – Simon Tomlinson of Jubylee Bakes who supplied and handed out bakes to guests at the event. Also, on the judging panel and presenting at the showcase were the two founding partners of the initiative Lorraine Nugent and Matt Turner who co-presented the evening. MPower Clothing plan to make fashion inclusive for people of all abilities by attempting to create designs that can be implemented into mainstream fashion through creating some bespoke designs. MPower Clothing plans to have a business that alters clothes for disabled people in the first instance and those who want more independence. Once the brand is established MPower will create its own range of clothes. Student Inspire Network is a millennial platform that educates motives and inspires students to start thinking about careers by bringing careers information to social media channels. The company create, design and deliver millennial focused video careers content that allows corporates to maximise their student reach, and showcase careers in a dynamic, student friendly manner. MiiLKSHAKE is a multi-platform publication and community for young female creatives, from all sectors of the arts industries. The platform consists of a website, as well as an annual magazine accompaniment that will share the same values and themes of content, featuring work from a variety of young female creatives from across all sectors of the arts industry. Green Carbon aim to deliver sustainable energy-storage systems through creating innovative, next generation battery architectures for all market sectors that will reduce the weight, charging times and packaging constraints of conventional battery systems whilst being made from abundant, lightweight and non-toxic materials. On Thursday 15th February, eleven young entrepreneurs met at Thales Group, Manor Royal to pitch their final business plans to a panel of professionals in the hopes of being named the winner of the South East Entrepreneurial prize fund of business products and services. Young Start-up Talent (YST) initially launched in Gatwick in 2010, encouraging young entrepreneurs aged between 16 - 25 years old to start their own business. Eight years on, the initiative has proven to be a great success, and is now run across the whole of the South East and London. Working with over 140 local and national businesses, Young Start-up Talent award one lucky winner a prize fund of business products and services, providing them with all the tools they need to kick-start their business. Since launching, the YST team have been blown away by the quality of young entrepreneurs that have applied for the process, with this year being no exception. After successfully making it through the first stage, the budding entrepreneurs were invited to undergo a business-know how workshop where they were given the opportunity to meet their fellow contestants. From there, the entrepreneurs participated in a 1-2-1 styled speed-networking event with local sponsors and business professionals. Discussions went on into the night, before only five businesses were chosen to go through to the next round, The Pitch. On the evening, the young entrepreneurs pitched their business ideas to five fiery judges, including; Daryl Gayler, Managing Director for the Southwest Region for Natwest; Ellen Walsh, Partner at Grant Thornton Accountants; David Kickham, Service and Operations Director for Thales Group; Matt Turner, CEO of Creative Pod and Co-Founder of YST and Lorraine Nugent Co-Founder of YST and Public Relations Specialist at Wildwood PR. MPower believe fashion can help with empowerment that has a wider affect in helping people deal with mental health issues, such as depression. MPower plans to have a business that alters clothes for disabled people in the first instance and those who want more independence. Once the brand is established MPower will create its own range of clothes. Student Inspire Network is a millennial platform that educates motives and inspires students to start thinking about careers by bringing careers information to social media, on platforms such as Facebook, Twitter, Instagram, Snapchat and LinkedIn by creating millennial focused content for the social consumer. The company create, design and deliver millennial focused video careers content that allows corporates to maximise their student reach, and showcase careers in a dynamic, student friendly manner. Green Carbon aim to deliver sustainable energy-storage systems through creating innovative, next generation battery architectures for all market sectors that would massively reduce the weight, charging times and packaging constraints of conventional battery systems whilst being made from abundant, lightweight and non-toxic materials. 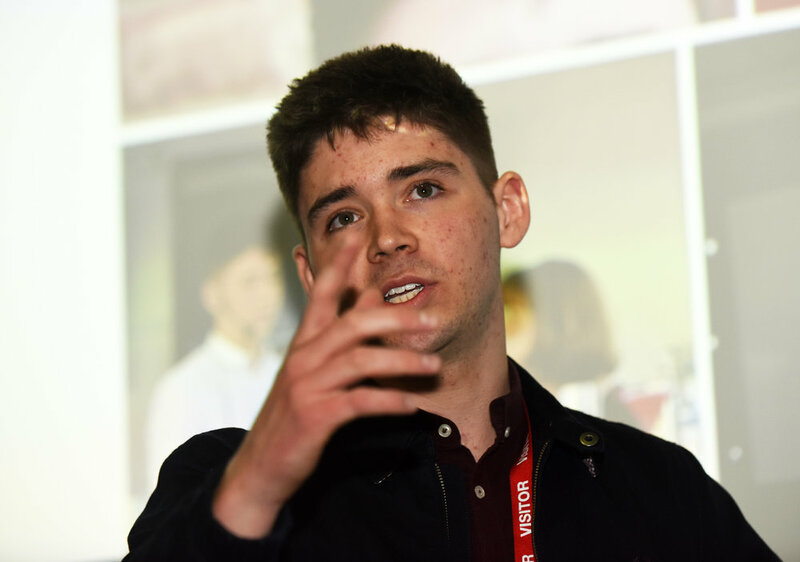 Young Start-up Talent would like to thank Ben Chubb of NatWest for the behind-the-scenes work and for ensure everything ran smoothly, from helping with the filming of the event to the AV and calming the nerves of the finalists. The winner of the Young Start-up Talent initiative for the South East will be announced on Monday 12th March 2017 at Lingfield Park Resort. The judge’s and sponsors decision will be working with the lucky winner over the next 12 months. Young Start-up Talent (YST) hosted its annual speed-networking event at Basepoint Business Centre with young entrepreneurs from around the South East, all hoping to inspire and impress business professionals from the local area. Each candidate was competing for their place in the final five, bringing them one step closer to being announced as the winner of prize fund of business products and services. The entrepreneurial initiative ‘Young Start-up Talent’ was first in launched in the Gatwick Diamond back in 2010 and has since expanded across the South of England and London. With its eighth year in full swing, YST are very proud to work alongside a host of businesses, all of which support the next generation of entrepreneurs. Sponsors for the South East Region include companies such as NatWest, Lingfield Park Racecourse, Thales Group, Grant Thornton Accountants and many, many more. New to the panel of business professionals this year is John O’Mahony, Partner at Grant Thornton who attended the event said, “The event was brilliant, we heard some great business ideas and met a group of very bright, brilliant young people”. Whilst fellow judge and sponsor Daryl Gayler of NatWest added “the entrepreneurial talent just gets better and better each year”. Ten young business minds pitched their business ideas on a 1-2-1 basis to each of the 25 business professionals that attended the event. The candidates had just ten minutes to convince the sponsors of the feasibility and originality of their business, whilst also showing their entrepreneurial passion and creativity. Joshua de Wit of Sussex University with his sustainable energy storage solution ‘Green Carbon’, Milimo Banji with his business ‘Student Inspire Network’ to help motivate and educate students to start thinking about their career paths, Natasha Drakakis of ‘VoiceBlog’ - an online platform to aid those with a disability to blog online using audio, Harriet Douglas of Miilkshake - a multi-platform publication and community for young female creatives, Alexander Heron with a bakery in East Grinstead, Angel Odumosa of Angel Orose - an innovative cosmetic lip range, Matthew Pritchard - an inclusive fashion and alteration brand for those with disabilities and Samara and Merrissa Gidden with Haus of FLVR - contemporary alcohol infused ice lollies. Finalists and sisters Samara and Merissa Giddon of Haus of FLVR commented “We both found the session to be informative and engaging”. The process will continue over the next couple of months, with the final five entrepreneurs formally pitching their businesses to the panel of five judges at the offices of Thales in Manor Royal during February. The winner of the prize fund of business products and services will be announced at a showcase final on Monday 12th March 2017 at Lingfield Park Resort. Young Start-up Talent (YST), an entrepreneurial initiative powered by NatWest and aimed at young entrepreneurs aged 16-25 years old, were honoured to host their London Showcase and first Gala Dinner for 2017 at the NatWest HQ in Bishops Gate, London on Thursday 21st September 2017. After months of hard work, business workshops and presentations, it was announced that Leon Watson & George Foster of Savi (savi-app.com) - were the lucky winners of the YST London ultimate entrepreneurial business prize fund of products and services to help take their business to the next level. Savi, an online platform looking to disrupt the outdated loyalty card industry that allows users to accumulate loyalty points automatically when they spend through their mobile phone or by using debit/credit card driven transactional data. The app is currently being trialled in Nottingham were the duo have 30 large brands including Bella Italia and Ask Italian already signed up with a large uptake of users for the beta testing of the app which is looking to be set for success. The pair went on to congratulate their fellow finalists. The duo now plans to focus on growing their business using the tools and advice given to them by Young Start up Talent, the Judges and sponsors. Lead sponsor of the event was NatWest with speaker Daryl Gayler, Managing Director, South Region commenting; “Another fantastic evening spent celebrating with the finalists of Young Start Up Talent London 2017. At NatWest we are very proud to be associated with such a great initiative - supporting, mentoring and recognising the achievements of our young entrepreneurs. I never cease to be amazed by the passion, determination and energy they display in starting up their own businesses. Young Start-up Talent was also honoured to welcome past winners from other regions to the event with some sharing their experiences to the audience such as successful artist Stephanie Kane, Dean Day of Greenlight Games and Ben Jeffries of Influencer. Also on the judging panel and presenting at the showcase this year was were the two founding partners of the initiative Lorraine Nugent and Matt Turner. CreatiMatch - an ideas and skills matching platform exclusively for university students. It connects students in different locations with ideas that have the willingness and expertise to contribute effectively in order to establish founding teams. TheEcoSmart is the UK’s first on-demand, eco-friendly, mobile car wash app. Customers can request and Pay for all services on their app, website and over the phone. Using their eco-friendly solution with a Bespoke Nano-spraying technology and versatile branded smart cars they provide their services to customers in London. TheEcoSmart uses 93% less water than the average car wash with minimal water runoffs and no splashes. Zoo Town is a forward thinking online platform that connects students from universities across London with employment opportunities. With more than 558,000 young students aged 18-24 in the UK facing unemployment, Zoo Town aims to tackle and change this forever. With all payments being taken online and paid directly to the student, Zoo Town aims to revolutionise the way students and employers find the jobs and support that they need. Local Spoon is a web application for last-minute price drops on independent restaurants in Central London. Their innovation is to merge the online last-minute services with the offline casual dining. The App is using geo-location targeting to only promote offers at tables that would otherwise remain empty – thus representing an opportunity for the business to reduce waste and reach a wider market. Founding Partners of the initiative Lorraine Nugent and Matt Turner further added "we have had a terrific year and feel humbled to have worked alongside so many youngsters with such exciting futures ahead of them and wish them all well. We would like to thank all our candidates, judges and sponsors for making it all possible as without their support and generosity Young Start-up Talent would not exist. Judges and finalists on stage at Winchester Science & Planetarium [Left to right - Royston Smith MP, Paul Stacey, Mat Turner, Lorraine Nugent, Ming Wu, Jonathan Tellyn, Jeremy Mutebi, Adam Stannard, Natasha Tiffin, Chris Allington, Alice Dixon, Cheryl Gourlay and Chis key. Young Start-up Talent, an entrepreneurial initiative powered by NatWest and Oxford Innovation and aimed at young entrepreneurs aged 16-25 years old, were honoured to host their Hampshire Showcase for 2017 at Winchester Science and Planetarium Centre on Thursday 14th September 2017. After months of hard work, business workshops and presentations, it was announced that Jeremy Mutebi of J.M. Mutebi (@JeremyMutebi), an online stylist business and current student at Southampton University was the lucky winner of the ultimate entrepreneurial business prize fund of business products and services to help take the business to the next level. Following the announcement, Jeremy stated, “I am shocked to have won the prize fund with such tough competition and feeling humbled– just before the announcement I spoke to my Mum on the phone – she said that she would pray to god for a positive outcome – I believe god answered her prayers.” Jeremy went on to congratulate his fellow finalists and offered them his help and support going forward. Jeremy now plans to focus on growing his business using the tools and advice given to him by Young Start up Talent, the Judges and sponsors. Richard May, Innovation Director at the three Hampshire centres of Oxford Innovation, said: “Jeremy is blessed with a vibrant personality that captivates everyone he pitches his well-thought-out ideas to. He has carefully researched the menswear market in the UK, has a remarkable talent to pick out clothing combinations from high street retailers of all price points and understands how to use social media, such as Instagram, to generate customers in this growing space. We look forward to mentoring and helping Jeremy finesse his business plan and financial forecasts in the coming year. Cheryl Gourlay – Strategic lead for young entrepreneurs for NatWest and judge commented “NatWest has a strong history of working UK-wide with young people to find, develop and unlock talent. We are passionate about helping to support young people with skills that will allow them to flourish in later life, whether that’s working for someone else or setting up their own business. Young Start-up Talent was also honoured to welcome guest speakers Chris Allington Chairman of Oxford Innovation, Cheryl Gourlay – Strategic Lead for Young Entrepreneurs of NatWest and Royston Smith - Conservative MP for Southampton Itchen Constituency. Royston Smith MP said “It was a privilege to be involved in this year's Young Start Up Talent. I was really impressed with all the young people that entered and particularly those that made it through to the final round. The judges found it almost impossible to choose one winner from such a talented group. However, Jeremy Mutebi impressed us all and pipped the other finalists to the post. His mixture of style, innovation and personality will, I'm sure mean we will all be seeing a lot more from him in the future and I wish him good luck on his entrepreneurial journey." Also on the judging panel this year was Paul Stacey of IQ Business Consulting Ltd -Charted Accountants, who has also worked alongside the finalists to help with their financials going through the process and said, “I have enjoyed working and listening with the high calibre contestants, all their pitches were amazing.” The other two judges were the two founding partners of the initiative Lorraine Nugent and Matt Turner. TOM FOWLER & CHRIS KEY of DESIGNER TOOLKIT and based in Southampton. After spotting ways to make designers and their clients’ lives easier, The Designer Toolkit was set up, offering a suite of online tools to streamline design workflow, improve client interaction and make more money. Their products include: A brand asset management and sharing platform to ensure correct logos, fonts and colours are used. JONATHAN TELLYN & ADAM STANNARD of INNOBOX DESIGN also based in Southampton. Innobox Design is a graphic design agency based in Southampton, UK. Specialising in branding, marketing tools, 3D imagery and promotional materials. “We found that the pitching part of the process was highly beneficial – we found that also found watching and talking to the other candidates that we learnt a lot”. On Thursday 20th July, five business professionals met at the impressive London office of NatWest in Bishops Gate, to hear from eight young entrepreneurs to give their final presentations in an attempt to win the Young Start-Up Talent prize fund of business products and services to help kick start their businesses. The winner will be announced at a black tie showcase and gala dinner on 21st September at the NatWest offices in Bishops Gate. The finalists were chosen following the previous speed networking event, where the semi-finalists shared their business ideas with the sponsors and judges. Making up the judging panel for the London were: Phil Hall of NatWest, Bill Morrow of Angels Den, Simon Maddox of Owadally & King and the Young Start-Up Talent Co-Founders Matt Turner and Lorraine Nugent. Phill Hall of NatWest commented, “All of the finalists have done amazingly well with all showing a good balance of skills to take their businesses to the next level” whilst Bill Morrow further commented “what an amazing night and honoured to part of the judging process – five worthy businesses that all have an exciting future ahead”. Simon Maddox of Owadally & King adding, “Everybody was professional, knew their numbers and were brilliant. The calibre of talent was incredible and there was a broad diversity between everybody. I would be happy to support all of them. Aftaab Akram and Allam Akram, with ‘TheEcoSmart’ – UK’s first on-demand, eco-friendly, car washing app using a Bespoke Nano-spray technology and versatile branded smart cars to provide their services to customers in London. Customers can request and pay for all services through their app, website and over the phone. Ibiere Banigo, with ‘Zoo Town’ – a forward-thinking online platform that connects students from universities across London with employment opportunities. Ibiere said, “I am grateful to have come this far, I just want to enjoy today and see where it takes me”. Diana Florescu, with ‘Local Spoon’ – a smart application which helps you save money with great restaurants and get rewarded for what you know best - sharing offers with your friends, writing reviews and being a loyal customer to your favourite restaurants. Diana also commented, “We are revolutionising a multi-billion dollar global industry with dynamic promotions. Restaurants have the freedom to instantly promote tables that otherwise would remain empty and to avoid throwing food once again". George Foster and Leon Watson, with ‘Savi’ – an app that replaces the traditional reward scheme that allows users to accumulate loyalty points automatically when they spend through their mobile phones or using debit/credit cards. Tade Fadairo and Kimberely Moyo, with ‘CreatiMatch’ – an ideas and skills matching platform exclusively for university students. The duo said, “It went by really quickly – the questions were more grilling than expected”. Young Start-Up Talent would like to use this opportunity to thank everyone who was working behind-the-scenes and making this event so successful. Lorraine Nugent and Director of Young Start-up Talent added “the calibre for London along with the businesss plans and presentations far exceeded everyone’s expectations” and went on to say “a huge thank you to the judges, sponsors and YST team and of course the candidates for their time, commitment and energy during the process”. On Thursday 13th July, eight eager young entrepreneurs pitched to six judges at Southampton Solent University for a chance to walk away with prize pot worth of business products and services to help progress their businesses. After previously impressing the judges at a speed networking event, the five finalists were chosen to continue their journey with the initiative and give a formal presentation of their business plans to the judges. The Line-up: Richard May, Paul Stacey, Ming Wu, Matt Turner, Royston Smith MP, Jonathan Tellyn, Lorraine Nugent, Adam Stannard, Natasha Tiffin, Chris Key, Alice Dixon, Tom Fowler, Caroline Barfoot, Chris Allington, Cheryl Gourlay and Jeremy Luzinda. Caroline Barfoot – Head of Employability and Student Enterprise at Southampton Solent University said “We are delighted to be a sponsor of the competition this year and to host the finalist pitches inside the Pod at the new Spark Building. This is such an amazing opportunity for young entrepreneurs to receive feedback and support for their business start-ups from experts in their field. We are really proud that two of the businesses are from Solent University – encouraging enterprise is at the heart of everything we do and its wonderful to see students on our MA Creative Enterprise getting into the finals. Making up the judge’s panel this year is, Chris Allington of Oxford Innovation, Cheryl Gourlay of NatWest, Royston Smith MP for Southampton, Paul Stacey of IQ Business Consulting and co-Founders of Young Start-Up Talent, Matt Turner and Lorraine Nugent. Ming Wu, with ‘The Maker’s Guild’ – a creative studio environment for anyone, individuals, groups and small businesses to use to create physical things using the latest in prototyping technologies, such as 3D Printers and Desktop CNC. Jeremy Luzinda, with ‘JeremyMutebi’ – creating ensembles formed of separates from retailers meticulously put together. Jonathan Tellyn and Adam Stannard, with ‘Innobox Design’ – a graphic design agency, specialising in branding, marketing tools and promotional materials. Natasha Tiffin and Alice Dixon, with ‘Seek a Word’ – an app and office to provide businesses/customers with regular or singular translation. The girls commented, “We have had such a great experience so far with our time with Young Start up. We have learnt so much!”. Young Start-Up Talent would like to take this chance to thank those who were working behind-the-scenes to ensure that every part of the event was running smoothly. The winner of the prize fund and the Hampshire round 2017, will be announced on Thursday 14th September at the Winchester Science and Planetarium. After months of hard work, business workshops and presentations, Young Start-up Talent (YST), an entrepreneurial initiative aimed at 16 to 25 years old, was proud to host their fifth Showcase for Brighton’s finest young entrepreneurs at The Platform on Wednesday 15th February. It was announced that Andreas Georgiades of Brighton Greeks and current student from Sussex University is the lucky winner of the ultimate business prize fund of products and services worth £50,000. Andreas now plans to continue moving forward with his business, solidifying his relationships and getting to know the community, allowing him to strengthen the company’s message: “To create a home away from home” for the Greek and Cypriot communities. Ana Christie, CEO of the Sussex Chamber of Commerce, stated; “This has been my first year as a judge for Young Start-up Talent and it has been a fantastic experience. It has been brilliant to see how the candidates have developed over the last few months and how they have taken on board all our advice moving forward”. After launching this year's initiative in June of 2016, YST have worked hard to find the very best young entrepreneurs living across Brighton and Hove. The successful applicants were then invited to a business workshop before they faced a selection of local business professionals in a 1-2-1 styled speed-networking, where they gained invaluable advice on how to develop both themselves and their business. From there, the candidates were whittled down to just five finalists. The finalists pitched their refined business plans to a panel of six judges. On top of this, the finalists had to hold their nerve in front of a film crew, as their pitches were recorded and shown at the Showcase. After a tense wait, Andreas Georgiades was announced as the fifth Brighton winner with his business Brighton Greeks, which aims to create a home away from home for the Greek and Cypriot community of all generations and backgrounds in the wider Brighton area, by connecting them through a variety of services and consumer products. Young Start-up Talent was also honoured to welcome guest speakers, Nick Musto, Founder of Radar UK and Winner of YST Brighton in 2016, Tim Hawkes from Unlimited Potential, a business development company that uses a coaching approach in all their programmes, “being around the youngsters has given me new energy!”; and Ben Jeffries, winner of YST Kent in 2016 and Founder of Influencer, a marketing agency that specialises in social media campaigns. Young Start-up Talent would like to thank all the sponsors who have helped make the YST Brighton initiative to be a brilliant success. We would also like to thank the YST team behind the scenes, who ensured the whole process ran smoothly. On Tuesday 14th February, Young Start-up Talent (YST), an initiative aimed at young entrepreneurs aged between 16 - 25 years old, and Unloc Enterprise Academy, a programme to enable schools and colleges to inspire, motivate and develop the enterprising mindsets of their young people, announced a new strategic partnership. The companies will collaborate in an attempt to inspire a larger audience of young and budding entrepreneurs who need support and guidance to kick-start their own business. Through a number of business workshops provided by Unloc Enterprise Academy and the opportunity for one lucky entrepreneur to win a prize fund of business products and services worth £50,000 from YST, the companies aim to use the partnership to give young entrepreneurs throughout Hampshire all the tools they need to make it in the business world. Known throughout Hampshire's network of schools and colleges, Unloc Enterprise Academy delivers both short enterprise courses spanning over 12 weeks, as well as specific enterprise days, allowing the young students to develop their business skills. Over the course of the next few months, both companies are looking forward to seeing how the new partnership develops and how they can encourage as many young entrepreneurs to follow their dreams of starting their own business. After nearly a year's worth of hard work, Young Start-up Talent (YST), an entrepreneurial initiative aimed at 16-25 year olds, was proud to hold their very first Final for Chichester at the South Downs Planetarium on Thursday 12th January. 17 year old Tom Orchard of Tom's Computers was announced as the winner of the prize fund of £50k worth of business support to help kick start and grow his business. Over the past year and after visiting and running workshops in the local schools and colleges, including the University of Chichester, the chosen applicants were given advice and support for their business ideas through both a business know-how workshop and a 1-2-1 styled speed-networking event with local businesses and sponsors. From there, four lucky finalists were chosen to present and pitch to a panel of seven judges. Finally, the judges awarded Tom Orchard a current sixth form student at Bishop Luffa School, with his business Tom’s Computers, the very first winner of YST Chichester. Tom’s Computers offers a wide range of services, including, but not limited to, computer repairs, iPhone repairs and custom PC building, helping you to get back to your tech as soon as possible. Tom believes that this an area of the market that has not yet been taken over by one company, and he feels that his company could become this leader. On top of this, a number of judges and sponsors also showed their support at the final. Another judge and sponsor, Louise Hastings, along with her colleagues Andrea Wulff and Andrew Henshaw of Moore Stephens (South) LLP were delighted to attend the showcase. Andrea Wulff commented; “As chartered accountants based in Chichester, we are always happy to support young entrepreneurs in their quest to start their own businesses. The quality of the four finalists on the night was exceptional. It was a pleasure to see them presenting their business ideas to the audience, and we were proud to be able to be a part of the initiative and wish all the entrants’ success for the future". Young Start-up Talent would like to thank all the sponsors and supporters of the initiative, as well as all the people who work behind the scenes to ensure the whole process runs smoothly.